Casa Nelly must be seen to be believed. Perched on a rock promontory and situated as if it had sprung from the rock itself it has an incredible wraparound ocean frontage with views that stretch on into infinity. Because of its unique peninsular location every room is on the oceanfront. Constructed from cafe au lait colored rock excavated on site, local woods and material wherever possible, open to the breezes, the house is cool and welcoming while just outside its palm leaf roofs are gardens, pool and ocean alive in the warm sunshine. From your arrival until your departure you will be swathed in luxury -- from the feel of all the nature around you to the attentive professional staff that will make your stay a joy. Our chef will feed you until you cry uncle from all the local delicacies -- from lobster and abalone (both caught out front) to beautiful local Mexican dishes and other daily fresh seafood. If you'd like to see a brilliant sunset every day from our private beach access or perhaps while sipping a margarita in our oceanfront infinity swimming pool, maybe you should come pay us a visit. 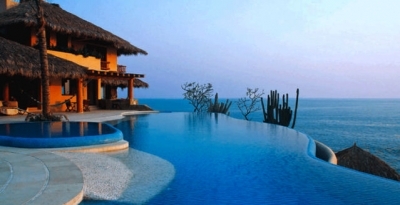 We are about five minutes from Zihuatanejo and two minutes from Ixtapa but may as well be in the middle of nowhere. We might be a little hard to find, and we like it that way. Come get lost in luxury that is Casa Nelly. You may not find your way out again. Peak: 1 week minimum stay required. High: 5 day minimum stay required. Low: 3 day minimum stay required.